In honor of the DVD release of Satantango, I have decided to write an entry for Jim Emerson's ongoing Opening Shots Project for it. The entry will give away no significant details of the film's plot and should help create a framework to view the opening shot, if not the entire film. It does discuss some major themes and ideas, so if you want to go in with no knowledge, then I suppose there are spoilers ahead. For reference, the still below is not from the opening shot. The opening shot can be viewed at the bottom of this post. Again, a special thanks to Jim Emerson for the spearheading this project and keeping these discussions alive. 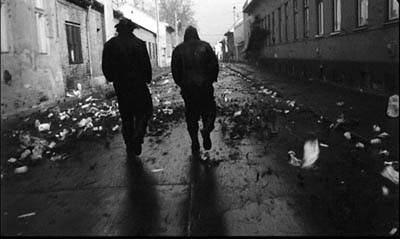 By showing a herd of cows move across a damp, tepid landscape filled with decrepit buildings, houses, and barns, Bela Tarr’s eight minute opening shot to his seven-and-a-half hour masterpiece Satantango quietly manages to set the strange tone and mood of the entire film, while also metaphorically illustrating the journey the characters will take over the course of the film. Satantango is a long journey where characters wander, stroll, and plod through their village waiting on a mysterious visitor to bring them money to close down the farm. Taking place near the end of Communism in Hungary, a collective identity is very much at stake, and this highlighted by the wonderful opening shot. Surrounded by a howling wind (and accompanied by an eerie score), a group of cows graze together deep in the frame. Signs of the Satantango’s black comedy are present when several cows unsuccessfully attempt to mount the others. A single cow moves down in the frame and walks out of the frame to the right and then to the left. Mooing get louder and works as a signal for the cows to follow each other across the field. The camera glides along the group as the cows slowly progress in the same direction, following each other across the muddy land. The cows continue walking and mooing until they walk to the back of the frame and vanish behind a set of houses. 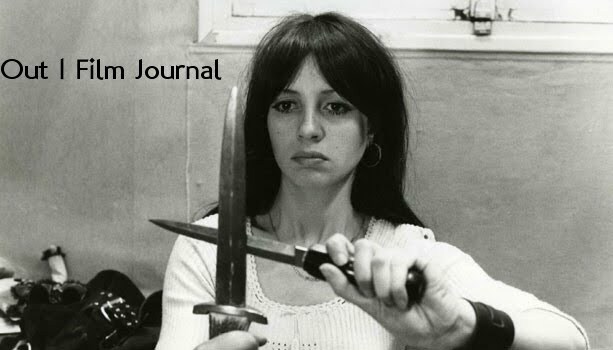 J Hoberman says every edit in a Bela Tarr film is an event, and that description is perfectly apt for the transition from the field of cows into the next shot. There is no real reason this shot couldn’t have gone on longer if the cows kept walking, but their exit from the frame after this long walk is what most keys the audience in to Tarr’s major themes and, in a narrative sense, the characters they will soon meet. It is an event not only in that the shot has (finally) ended, but the shot itself is a whole story that the rest of the Satantango will thematically follow. Where the cows go beyond the houses is uncertain, but the collective movement and disappearance of the entire group of cows mysteriously, and miraculously, reflects the motif and progression of Satantango’s plot. Without introducing a single character, this opening shot can be seen, if only after a complete viewing, as a precursor to the events that will come. Moreover, it establishes the type of world the characters inhabit and creates a bookend with the incredible final shot that leaves an engaged viewer in a stirred daze. In the equally great opening shot to Tarr’s film Werckmeister Harmonies (2001), Tarr shows us how the entire world of the narrative will work by showing us the characters in their typical locale illustrating the earth revolving around the sun. Drastically different in its approach, Satantango does the same by merely following a herd of cows wandering through a field. Tarr may be the modern master of the single shot, and Satantango, as well as Werckmesiter Harmonies, illustrate Tarr as the master of the brilliant opening shot. Satantango’s opening shot is just as striking, at least to me, for its lack of characters and willingness to mimic the narrative with an unflattering metaphor. The characters in Satantango are this herd of cows, wandering through the remains of a destroyed society until they, and the society itself, vanish. did the ending make sense to you? 'Cause i was completely lost. DVD Release of "The Long Day Closes"!